When the New York Times released Snow Fall — a Pulitzer Prize-winning piece of multimedia reporting that integrates text, images, video and animation — the piece was hailed as a new standard of online journalism. Other organizations and content creators followed suit, imitating the form and even copying the original Snow Fall content. But is this the right form for all online reporting? It would be “a shame for your content,” Tan said, to use this form without understanding the principles behind it. These principles were the focus on Tan’s talk at Books in Browsers, specifically what factors creators and designers should consider as they build the online content. Many people, Tan said, use two words to describe online, multimedia content: “immersive” and “intuitive.” The problem with these two words is that they are too vague. “We don’t have a precise enough language to figure out” what these words really mean, said Tan. So what is “intuitive” and “immersive” content really look like? In order to build something that is truly intuitive, Tan believes content designers need to consider three factors: legibility (how users know they can scroll or click), metaphor (how users understand something like a virtual scroll or a window to pan through), and skills (can users actually operate the technology). So perhaps the content is beautiful, but if users don’t know how to advance the content, or don’t understand how the content is laid out, you are indeed doing a disservice to the content. #bib13 @TealTan @NYTimes "When things are not intuitive, look at these three layers" — legibility, metaphor, skills. In terms of immersive content, Tan said that this really means “being able to focus, to not be easily distracted” while consuming the content. In order to grab hold of your readers with your content, Tan told the audience to look at three factors: attention (“deciding what’s foreground and what’s background”), rhythm (pace the content to purposefully pull the reader out of their current frame and move on to the next), and weight (“the idea that you should be able to control the visceral reaction” of your readers to the content). “I just hope that people start to look at these factors more and future out how you can exploit them for a better form of storytelling,” Tan concluded. 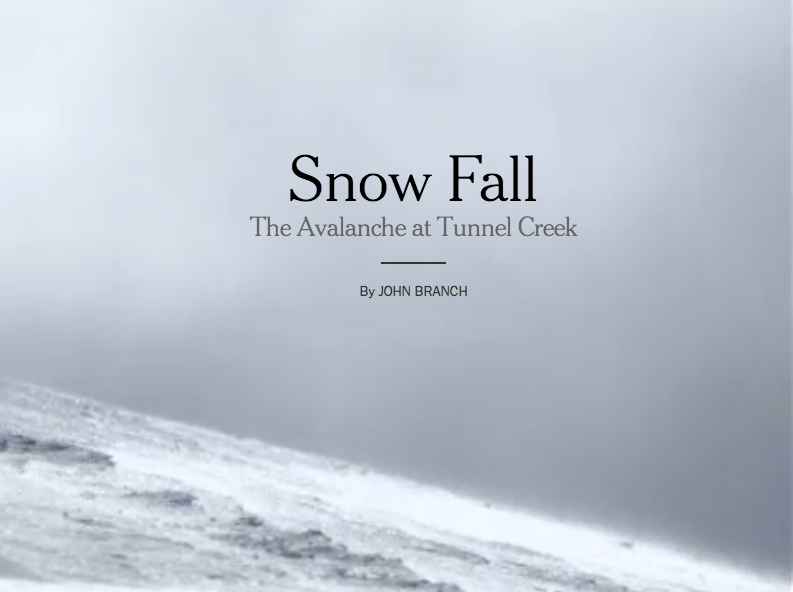 So perhaps what the Snow Fall project really created was not a new form of online journalism, but a better framework or vocabulary for content creators to consider as they work with new forms and online media.